A stoppage-time winner from Florent Sinama-Pongolle saw Chicago Fire give outgoing captain Logan Pause a winning MLS finale. Chicago came from behind to defeat Houston Dynamo 2-1 on Friday in both sides’ last match of the MLS season with neither in the play-offs, as Jeff Larentowicz’s penalty and Sinama-Pongolle’s header gave the Fire victory. Dynamo had led since the 18th minute through Omar Cummings but could not give coach Dominic Kinnear a gift of three points as the 47-year-old prepares to rejoin the San Jose Earthquakes next season. Instead it was Pause who would be given a fitting farewell, with Sinama-Pongolle glancing a header from Grant Ward’s right-wing cross inside the near post in the 91st minute at Toyota Park. 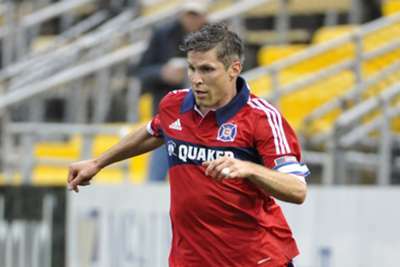 Defensive midfielder Pause completed his MLS career with 286 appearances for the Fire, which included two US Open Cup titles (2003 and 2006) and the Supporters’ Shield in 2003. Houston hit the front thanks to Cummings’ header from a corner but they were reeled in after 65 minutes with Larentowicz converting from the spot, following Tyler Deric’s trip on Ward. Then Sinama-Pongolle’s first goal for Chicago since joining the club in September saw the home fans end the season with a smile on their faces. Kinnear – who moved to Houston when the former San Jose Sharks were relocated to Texas to form Dynamo in 2005 – will return to California with two MLS Cup titles from his time at BBVA Compass Stadium.